At one time the Haida nation dominated the west coast of North America. From the fastness of their home – an archipelago blessed by natural abundance off the coast of what is now northern British Columbia – they explored south as far as California - trading and sometimes fighting for slaves and treasure. Their wealth enable them to develop their art and culture to an unusual degree, and at the end of this journey you’ll experience their culture and hospitality. Before that you’ll explore the best of the Canadian Rockies, starting in Calgary and visiting all the highlights on your way north and then west to the sea. Space is very limited on this trip, so booking early is strongly advised. The lucky few will have a chance to learn about Haida culture and traditions from the Haida themselves – and when you understand just a little of their tragedy and their resilience you can’t help but feel inspired. This is what Canada is best at – beauty and wilderness that take your breath away. We’ve selected some of the most diverse eco-systems Western Canada has to offer on this trip. You’ll see unforgettable vistas and a huge variety of wildlife to go with it. Canada unplugged. After crossing the Hecate Strait by floatplane from the Canadian you’ll get a real insight into how the Haida people lived for thousands of years. Haida guides will take you out to ancient villages, and explain the culture and art of their people. You’ll also try their food and hear stories from elders – all amid the unspoiled wilderness of this very remote group of islands. We’ve curated a wide range of options for you to choose from, ensuring it’s your trip done in your way. Possibilities include everything from a helicopter tour of remote glaciers to a quiet evening canoe on a serene mountain lake. Welcome to Calgary International Airport! Pick up your rental car and drive through the Canadian Rocky Mountains to the town of Banff. The town of Banff is a unique destination as a UNESCO World Heritage Site with the charm of a small mountain community. Breathe in the fresh Canadian Rockies air – you’ve arrived! Overnight at the Juniper Hotel and Bistro. This hotel is nestled at the base of Mount Norquay, with convenient access to skiing and hiking, and just a few minutes by car from the heart of Banff. Enjoy easy access to outdoor recreation and spectacular mountain views. The alpine hotel features an on-site restaurant, outdoor hot tub, and seasonal complimentary shuttle service to and from downtown Banff. Fill your lungs with cool, fresh Rocky Mountain air and head out for a day of exploration around Banff National Park. Visit the Whyte Museum, to learn about Banff’s rich artistic and pioneering heritage. The most action-packed twelve minutes of your life! Get up close and personal with the world-famous Three Sisters. You will want to reach out a touch them as you whisk by them before escaping into the Spray Valley where you will explore the extraordinary hues of the Spray Lakes. After a leisurely morning in Banff, drive through scenic Banff National Park, across the border into BC. Arriving at the exquisite Emerald Lake Lodge, located in the heart of Yoho National Park in BC. Enjoy your day and let your worries disappear in the gorgeous outdoor hot tub surrounded by towering peaks. Tell us whether you'd like a full day of sightseeing, or a more more relaxed pace. Just 3.5 hours from Banff along the famous Icefields Parkway that straddles the continental divide, Jasper is a great base to explore Jasper National Park – the largest in the Canadian Rockies. Jasper is the gentle giant of the Rockies and this small mountain town offers visitors a more laid-back mountain experience, with equal options for adventure, discovery and relaxation. Jasper was once seen as an island of civilization in a vast wilderness, but recently has become a popular getaway from urban life, and a special place to reconnect with nature. Whether you’re rafting on the Athabasca River, overlooking the park from the top of the Tramway, hiking the trails, or soaking in rejuvenating natural hot springs, Jasper will give you that breathing room to relax and enjoy the best of this natural playground. Today your guide will lead you on a unique route along the Maligne Canyon Rim to bridge #5. You will feel the spray of the waterfall and hear its roar. Expect to learn about the mysterious underground drainage system as you walk the lower portion of this fascinating gorge. The water truly is this turquoise! Learn all about the ways that Jasper's animals contribute to the rich diversity of the National Park and how they survive the summer weather. As you travel by bus through the Athabasca Valley, a tour guide will show you some of the park’s most beautiful scenery. There is minimal walking on this tour, so sit back and enjoy the scenery from the comfort of a small tour bus. Board the VIA Rail Skeena Train, and glide along the tracks through the historic Yellowhead Pass and alongside the Fraser River, British Columbia's longest river. Board VIA Rail's Skeena train in Jasper and travel to Prince George today. Pass by lakes, railway towns, and mountain ranges, as you journey into the wilderness of northern British Columbia. You will be seated in a spacious, reclining seat in the Panorama Dome car. Hot and cold meals will be served at your seat. Enjoy access to the Park car, offering additional space to relax and enjoy the panoramic views. Your rail journey continues towards Prince Rupert. Great stretches of wilderness, lakes, and rivers are punctuated by small settlements, farms and sawmills. Wildlife such as bear, moose, elk, deer, wolves, coyotes, eagles, hawks and seals may be seen during the trip, depending on season and chance. From May to late July, ask your vacation specialist about adding a cruise to the untouched wilderness of Khutzeymateen Valley, home to the highest population of Grizzlies in North America. Here you can spot your first grizzly bear grazing in a meadow or tending her cubs, in a completely natural environment. Located on Kaien Island, Prince Rupert is the land, air, and water transportation hub of British Columbia's North Coast. The sheltered harbour is the deepest ice-free natural harbour in North America, and the 3rd deepest natural harbour in the world. The port is the first inbound and last outbound port of call for cargo and cruise ships travelling between eastern Asia and western North America, and is ice-free year-round, despite its northerly latitude. Prince Rupert is the starting point for many wildlife viewing trips including whales, eagles, and bears. The Khutzeymateen Grizzly Bear sanctuary features one of the densest remaining populations in North America; tours can be arranged by water, air (using float planes) or land departing from Prince Rupert. The region is also home to coastal wolves, and south of Prince Rupert on Princess Royal Island you’ll find the rare white “Spirit Bear” (Kermode bear). Your journey starts today with an awe inspiring flight over the Hecate Straight into the depths of Northern British Columbia, to the archipelago of Haida Gwaii. Step off the plane and begin your experience of a lifetime. 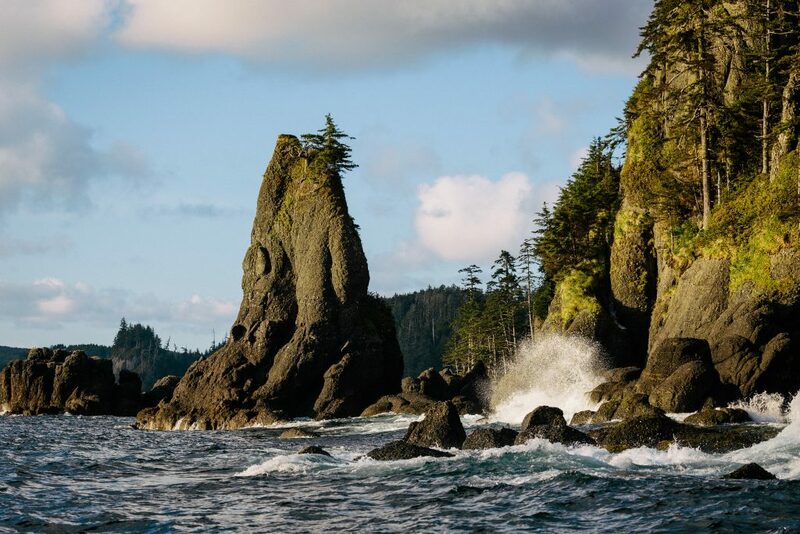 Want to experience the extremely remote West Coast of Haida Gwaii? Ask your Vacation Advisor to substitute Haida House for a brand new 12 room floating Lodge accessible by helicopter! Fly by seaplane from Prince Rupert to Masset. Soar over Haidi Gwaii and enjoy some of the most interesting and spectacular landscapes in North America. Upon arrival in Haida Gwaii you will be met by a representative and driven to the Haida House at Tllaal, your base for the next four days. An orientation with Cultural Services and a delicious dinner from local chefs is the perfect introduction to Haida Gwaii, also known as the ‘Islands of the People’. Fulfill your curiosity today as you become one of the family with your Haida interpreter and journey to the villages on Haida Gwaii to meet the local people and get an introduction to indigenous culture and tradition. The archipelago of Haida Gwaii offers numerous opportunities to dive into ancient culture and traditions. Start off with an escorted drive along the scenic coast to Skidegate Village, and Queen Charlotte City. Then immerse yourself in history at the Kay Lnagaay Heritage Centre and learn about the famous Haida Totem Poles and carvings. After a picnic lunch, visit a Haida artisan’s home studio to see weaving or jewelry making in action. Top off your day with a traditional Haida Feast; including locally harvested food served tapas style by a renowned Haida Chef. Set out today on an zodiak adventure along the coast of Haida Gwaii to Moresby Isalnd. Visit abandon villages along the way and gaze at the amazing totem poles that remain in the temperate rainforest landscape. Enjoy the wildlife viewing opportunities today as you travel to the places less known. Join a marine guide on a thrilling Zodiac tour to the remote K'uuna Llnagaay, a place with 12,000 years of human history. The main stop on this tour is the Haida village site of Skedans. Enjoy a guided tour of the totem poles and house pits that remain in the village which was abandoned in the 1880s. Chances to see marine wildlife and bears makes for an exciting zodiac ride back. Today you explore the beauty and nature of Graham Island. Learn about the captivating history and culture of the Haida Nation who have occupied the land for thousands of years. Enjoy a narrative drive today to the quaint villages on Graham Island. Along the way you will make stops to enjoy the temperate rainforest, beach comb on Agate Beach and end your day with a magical visit of the totem poles in Old Massett. Enjoy the stunning scenery from the window of the plane as you fly two hours south to Vancouver. Soar over endless mountain ranges, shimmering oceans, and massive glaciers. After breakfast at Haida House, depart on the last tour of your package. Visit the local Tlell Artisans’ studios and gift shops, including Ernie’s Woodworking Shop, Sitka Studio and the Crystal Cabin. Afterwards, you depart for the airport for your flight to Vancouver. This quick but scenic flight is the easiest way to get to Vancouver from Haida Gwaii. Much too soon, you leave the coastal mountain air and colorful sights of Canada behind as your Canadian vacation comes to an end. Ask us about adding some time in Vancouver! Some activities may not be available on all trip start dates, due to seasonal weather conditions. Your Vacation Advisor can provide further details. Hike in Sunshine Meadows is available from the July 1 to September 15, 2019 departure dates. Activities on Haida Gwaii are based on a minimum of 2 people. All marine excursions on Haida Gwaii require the ability to climb in and out of a vessel (cruiser or zodiac) on to the shore, as many ancient villages are only accessible by ‘beaching’ the vessel (no dock).